Stage shot of the musical "A Ride with Bob," a tribute to the life and music of Bob Wills. James Robert (Bob) Wills (March 6, 1905 – May 13, 1975) was an American country musician, songwriter, and band leader. A pioneer of the Western Swing genre, Wills merged traditional country music with sophisticated jazz-influenced arrangements in the "big band" style. At its height in the 1940s, Wills' brand of Western Swing was outdrawing the most famous northern dance orchestras. A captivating performer who entertained audiences with his stage banter and vocal encouragement of his fellow musicians as much as his own fiddle playing and singing, Wills' music gained a strong following first in Oklahoma and Texas, then throughout the southern and western United States. After World War II, he became a major force in developing the country music business in California and a strong influence on future country music stars such as Buck Owens, Willie Nelson, and Merle Haggard. His songs, especially "San Antonio Rose" and "Faded Love," remain country classics and have been covered by scores of artists. Wills was born on a farm near Kosse, Texas on March 6, 1905, the first of ten children born to John and Emma Wills. His father was a fiddle player who, along with Bob's grandfather, taught the young Wills to play both fiddle and mandolin. His first public performance was at a ranch dance in 1915. At 17 he left home to travel. In his 20s, "Jim Rob" attended barber school, got married, and moved first to Roy, New Mexico then to Turkey, Texas to be a barber. He continued alternating between barbering and fiddling even when he moved to Fort Worth to pursue a career in music. It was there, while performing in a medicine show, that he learned comic timing and some of the famous "patter" he later delivered in performances and on his records. The show's owner gave him the nickname "Bob." 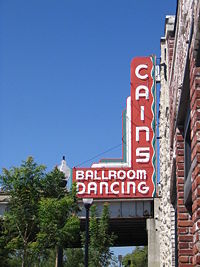 Cain's Ballroom, the site of Wills' popular radio broadcasts and dance performances in the late 1930s. In Fort Worth, Wills met Herman Arnspinger and formed The Wills Fiddle Band. In 1930 Milton Brown joined the group as lead vocalist and brought a sense of innovation and experimentation to the band, now called the Light Crust Doughboys in honor of their radio sponsor, Light Crust Flour. When Brown left the band in 1932, Wills replaced him with new singer Tommy Duncan. Wills and Duncan then left the Doughboys in 1933 and formed "The Playboys," relocating to Waco, and then Oklahoma City. Wills soon settled the renamed "Texas Playboys" in Tulsa, Oklahoma and began broadcasting noontime shows over the 50,000 watt KVOO radio station, originating from Cain's Ballroom. Their Monday-Friday noon hour broadcasts became a veritable institution in the region. In addition, they played to growing crowds at dances in the evenings. By 1935 Wills had added horns, reeds, and drums to the Texas Playboys. The addition of steel guitar virtuoso Leon McAuliffe in March 1935 added not only a formidable instrumentalist but a second engaging vocalist. Wills himself largely sang western style blues and sentimental ballads. With its jazz sophistication, pop music and blues influence, plus improvised scats and wisecrack commentary by Wills, the band became the first superstars of Western Swing. Milton Brown's untimely death in 1936 made the Playboys the undisputed kings of the genre. Wills' 1938 recording of "Ida Red" was a hit and served as a model for Chuck Berry's, decades later, song Maybellene. In 1940 Wills' "New San Antonio Rose"—a vocal version of Wills' 1938 instrumental recording—became the signature song of the Texas Playboys. By then, the Texas Playboys were virtually two bands: one a typical country fiddle-guitar-steel band with rhythm section, and the second a first-rate big band able to play the day's swing and pop hits as well as Dixieland. In 1940, Wills and the Texas Playboys co-starred with Tex Ritter in the movie “Take Me Back to Oklahoma.” Other films would follow. In addition to the 1940 film Take Me Back to Oklahoma, Wills appeared in The Lone Prairie (1942), Riders of the Northwest Mounted (1943), Saddles and Sagebrush (1943), The Vigilantes Ride (1943), The Last Horseman (1944), Rhythm Round-Up (1945), Blazing the Western Trail (1945), and Lawless Empire (1945). He appeared in a total of 19 films. In late 1942 after several band members had left the group, and as World War II raged, Wills himself joined the Army, but received a medical discharge in 1943. After leaving the Army, Wills moved to Hollywood and began to reorganize the Texas Playboys. He became an enormous draw in Los Angeles, where many of his Texas, Oklahoma, and regional fans had also relocated. He commanded large fees playing dances there, and began to make more creative use of electric guitars to replace the big horn sections of his Tulsa days. In 1944, however, the Wills band still included 23 members. That year, while on his first cross-country tour, he appeared at the Grand Ole Opry and was able to defy the show's normal ban on having drums on stage. In 1945 Wills' dances were outdrawing those of Tommy Dorsey and Benny Goodman. He relocated to Fresno, California, and then opened the Wills Point nightclub in Sacramento in 1947, continuing to tour the Southwest and Pacific Northwest from Texas to Washington State. During the postwar period, KGO radio in San Francisco syndicated a Bob Wills & His Texas Playboys show recorded at the Fairmont Hotel. Many of these recordings survive today as the Tiffany Transcriptions, and are available on CD. They showcase the band's instrumental strengths, in part because the group was not confined to the three-minute limits of 78 rpm discs. They featured superb work from fiddlers Joe Holley and Jesse Ashlock, steel guitarists Noel Boggs and Herb Remington, guitarists Eldon Shamblin and Junior Barnard, and electric mandolinist-fiddler Tiny Moore, as well as Wills himself. A binge drinker, Wills became increasingly unreliable in the late 1940s however, causing a rift with singer Tommy Duncan, who bore the brunt of audience anger when Wills' binges prevented him from appearing. Wills eventually fired Duncan in the fall of 1948. Having lived a lavish lifestyle in California, in 1949 Wills moved back to Oklahoma City, then went back on the road to maintain his payroll and the financially troubled Wills Point operation. A poor business decision came when he opened a second club, the Bob Wills Ranch House in Dallas. Dishonest managers left Wills in desperate financial straits, with heavy debts, including one to the IRS for back taxes that caused him to sell many assets, even including the rights to "New San Antonio Rose." In 1950 Wills had two Top Ten hits, "Ida Red Likes the Boogie" and the country classic, "Faded Love." He continued to tour and record through the 1950s into the early 1960s, despite the fact that Western Swing's popularity had greatly diminished. A 1958 return to Tulsa's KVOO, where his younger brother Johnnie Lee Wills had maintained the family's presence, did not produce the success he hoped for. Wills kept the band on the road into the 1960s. However, after two heart attacks, in 1965 severed his relationship with the Texas Playboys, who briefly continued as an independent unit, to perform solo with house bands. While he did well in Las Vegas and made records for the Kapp label, he was largely a forgotten figure. A 1969 stroke left his right side paralyzed, ending his active career. Wills' musical legacy, nevertheless, has been an enduring one. His style made California a second center of the country music industry after Nashville, influencing performers such as Buck Owens and Merle Haggard and helping to spawn a style of music now known as the Bakersfield Sound. A 1970 tribute album by Haggard directed a wider audience to Wills' music, as did the appearance of younger "revival" bands such as Asleep at the Wheel and the growing popularity of longtime Wills disciple and fan Willie Nelson. By 1971, Wills had recovered sufficiently from his stroke to travel occasionally and appear at tribute concerts. In 1973 he participated in a final reunion session with members of some the Texas Playboys from the 1930s to the 1960s. Merle Haggard also played at this reunion. The session, scheduled for two days, took place in December 1973, with the album to be titled For the Last Time. Wills appeared on two tracks from the first day's session but suffered a stroke overnight and was unable to continue. He had a more severe stroke a few days later. The musicians completed the album without him. Wills by then was comatose. He lingered until his death on May 13, 1975. Bob Wills was inducted into the Country Music Hall of Fame in 1968, the Nashville Songwriters Hall of Fame in 1970, and the Rock and Roll Hall of Fame in 1999. 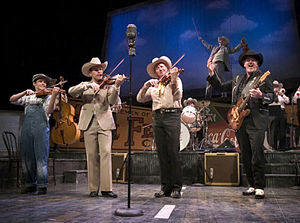 In 2005, Asleep at the Wheel was featured in the play "A Ride With Bob," including a live performance of 15 of Wills’ most well-known songs. The play sold out in theaters across the states and was attended by President and Mrs. George W. Bush at the Kennedy Center in 2006. Wills received the Grammy Lifetime Achievement Award in 2007. McLean, Duncan. Lone Star Swing: On the Trail of Bob Wills and His Texas Playboys. New York: Norton, 1998. Sandlin, Tim. Western Swing. New York: Holt, 1988. This page was last modified on 17 December 2016, at 22:22.